Message from the Founder and Executive Director, Weizero Mekdes Zelelew. From the outset, I had a strong belief in establishing this organization that I will be successful with the will of God and the support of kindhearted donors. I am still confident that IFSO’s vision to see a society where children are free from the effects of poverty in Ethiopia will be realizable. The General Assembly, the Board Members and the Staff are committed to make IFSO’s objectives achievable. There is no boundary for kind heart. So, we hope our stakeholders and donors will continue their support to us in our undertaking to help orphans and destitute children alleviate their problems and the endeavor we make to contribute to sustainable development will still be our determination to serve the community. The general assembly of the organization is the supreme organization of IFSO. The board comprising five members is elected by the general assembly that directs and regulates the organization. The Executive Director who is appointed by the board is responsible to manage the overall activities of the organization. The finance, the program and the administration officers discharge responsibilities in their respective fields of authorities. The project coordinators are responsible to directly executing the respective projects. The board comprises five members and is elected by the general assembly and its purpose is to direct and regulate the organization. The following are the five members of the board and their contact address is available at the Contact Us page. Ato Kebede Wolde Giorgis - Board Chairman. 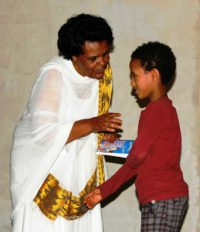 Dr. Melese Getu - Board Member. Sr. Alemitu Eteffa - Board Member. Ato Tamiru Ambachew - Board Member. Ato Selam Setegn - Board Member.